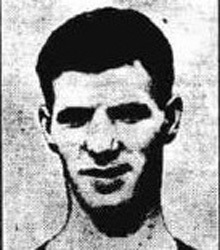 Jim Hendren (Inside forward, 1910-11) - Jim Hendren was born in Lochore in 1885. He worked in the Ayrshire pits for a time and was signed by Kilmarnock in 1904. He then went to the USA where he developed a love for golf and baseball. Subsequently, he came back and played for Maybole and Annbank. In season 1909/10, Jim Hendren turned out for Nithsdale Wanderers from Sanquhar. In 1910, Cowdenbeath obtained the fast and powerful Hendren's transfer from Nithsdale as he was now back in Fife living in Lumphinnans. Hendren soon showed his worth at North End Park and his goals helped inspire Cowdenbeath to new heights. Hibs were duly impressed and a notable fee took him to Easter Road. Jim was an automatic choice for Hibs over the next 4 seasons and was their top scorer for 3 consecutive campaigns, scoring over 50 goals in the 1st Division. He suddenly died in Edinburgh Royal Infirmary in June 1915. He was buried in the Eastern Cemetery at Easter Road. Jim was the great-uncle of ex-Hibs and Cowdenbeath manager Pat Stanton.